There are innumerable panifici in Sicily. Everyone you speak to has their own recommendation and usually some point of criticism of your preferred choice. But whichever panificio you choose you can be sure that the bread is baked in the morning and then again in the evening. The warm fresh bread comes in a gusseted paper bag. 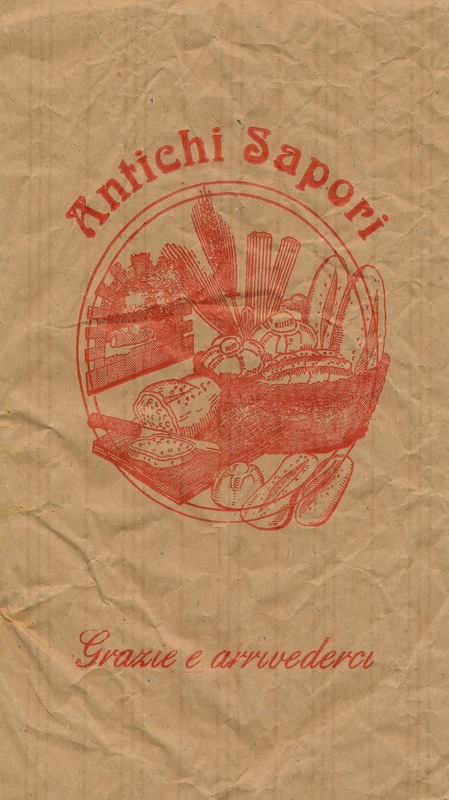 The examples shown here offer different signifiers and with them subtly different associations - La Bonta del Pane - The Goodness of Bread, Antichi Sapori - Traditional Flavours, Il Mondo del Pane - The World of Bread. The graphic illustrations add another dimension. The chef kissing his fingers (or is he twiddling his moustache?) in delight, is something of an archetypal caricature. His relaxed and laid back self assured manner acting as a guarantee of the quality of his bread. Whilst the second image viewed through an oval window allows us a glimpse into a scenario offering variety, abundance and authenticity. Olfactory and gustatory stimuli are triggered - you can almost smell the wood fired oven and taste the bread. The third example has a touch of the bucolic idyll but with a nod to technology. This is not just a bread shop but the world of bread - the processes from the cultivation of wheat in the field, to the mechanised mixing machines, the manual kneading and forming of the bread and the scale of production are all depicted - not so much world on a global scale but bread is their world. Man and machine working in harmony to produce a veritable abundance of bread.